We have lived on the central coast of California for 22 years, and it has only snowed here once in all that time(of course, growing up in L.A. county, it never snowed). That day the snow was so pretty and magical, but very short-lived! And we all know, where there's snow, there's hot chocolate! And where there's hot chocolate, there's marshmallows! The hot cocoa mug/cup cookies were made using homemade templates fashioned from a favorite, wintry kitchen towel. The snowflakes were made with a 1-inch round cookie cutter. The marshmallows were cut out, freehand, with a small knife. All the cookies were made using my favorite sugar cookie/royal icing recipe. The smiley faces and rosy cheeks on the marshmallows were drawn with AmeriColor Gourmet Writer food decorating pens. I love them~the pens and the marshmallows. Don't you think marshmallows look a lot cuter with smiley faces? :) I also sprinkled granulated sugar on all of the snowflakes, while the icing was still wet. Try these cookies with a big cup of hot cocoa and make your winter warm, cozy and yummy! Awwwwe look at how cute these are!!! These are really gorgeous! I love the colours you've used! I have to make edible snowflakes too if I want to experience them haha! Very very nice, you're amazing! This is ridiculously cute. I clicked on the link from my blog wondering what "hot cocoa cookies" were, maybe cookies for cocoa? Cookies that taste that cocoa? I spotted the image an in about a half-second I went over to Edible Crafts to post. I can't get over these... I think it's the marshmallows that did it. These are some of the cutest cookies! Thanks for the inspiration. This weeks assignment is care packages for the college students with a hot drink theme. Your idea is perfect. Not much snow in Florida either, btw. I LOVE the colors! And the little marshmallow faces are SO CUTE!! has to be one of the cutest cookies I have EVER seen. They are lovely and made me crack a BIG ole smile at work today and that says a lot! Sue I want to print this out and tuck it away for when I need an instant pick-me-up smile. I am smitten! OK. These are way too cute to eat. Good thing you have a camera to record them for posterity. They should be framed. We are having to look to cookies for snowflakes this year too. WE NEED SOME SNOW!!!! Oh my, these are so darn cute!!! I have lived here (California) most of my life and I've never had snow either. I absolutely love those little marshmallows!! Gorgeous, adorable, and ALL those things I am always saying to you! I love your cookies, Sue!!! These are so super cute!! I love the red/blue combo and those litle marshmallow faces push it over the edge (of cuteness). Great job as always Sue!! Such fun! I'm a huge hot cocoa fan. In fact I walked in the door from my bike ride last night and my son handed me a cup of hot cocoa knowing that I would be very cold after my heart rate came back down. It was heaven! What a good boy huh! I love the little marshmallows with your hot cocoa. What an adorable idea Sue! You always come up with such fun cookies! Thanks for sharing! I love the color combo of red/blue. What a great cookie for January. You are SO CLEVER!!! Love the rosy cheeks of the little marshmallow cookies. They are so cute! Love your tiny and very detailed snowflakes and your cocoa mugs are great. Don't think those marshmallows could get any cuter. Those cookies are so beautiful - perfect mugs of hot chocolate with marshmallow. I love those rosy cheeks on the marshmallows! I'm craving a cup of hot cocoa with them this very minute! These are so beautiful and wintery! They make me want to go find some snow! Those are adorable! You are an artist. Thanks for sharing them on Crazy Sweet Tuesday! These are so cute... love the little marshmallows! I love these cookies. The colors are wonderful and the smiling marshmallows are adorable. These are just the cutest. Blue is my favorite color which is an added bonus. Just when I think you can't come up with anything cuter, you do! These are as cute as can be. The cookies are beautiful!! The snow...hmmmm, here in NE Ohio we are in the middle of a snow storm so it's well, not so beautiful! The cookies and hot chocolate though would certainly help! I wish my cookies would come out this beautiful! 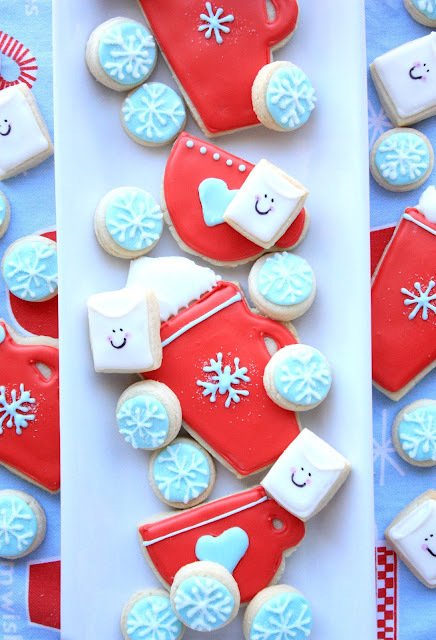 I'm hosting a Winter Wonderland link party on Monday and would love it if you linked up! I need to know your piping secrets!! You're amazing. They are so adorable and I love the colors! These cookies are so adorable and I'd love for you to link up to my newThematic Thursday meme. The theme this week is Winter and this would be a perfect addition. I'm a new follower now! These cookies are too cute! I found you on pinterest, and I'm featuring your cookies as my pinterest pick for my Friday Favorites event this week! These are the cutest things I've ever seen! I want to make them. Super cute! I'm your newest follower! These make me laugh! I love the colors and the smiling marshmallows! Thanks for adding them to the link party! !